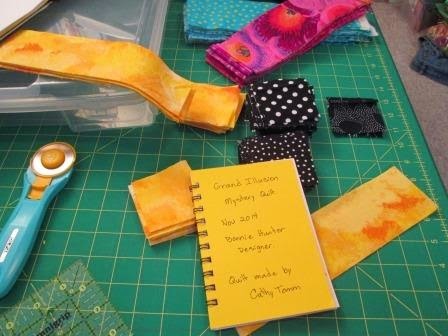 The mystery quilt Grand Illusion by Bonnie Hunter got underway on Friday. I had to work this weekend so I did not get all of step one done but I still did well. I am sure I will finish this step before next Friday. That is when the step 2 comes out. Today Bonnie is hosting a link up party, so I have linked up too. I picked out my fabric about a week ago. 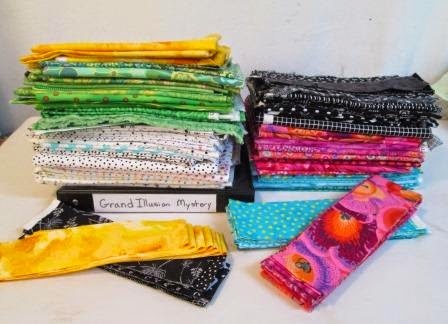 I did not buy a single fabric, it will be quilt from my stash only. I want the pink to be very bright and darker coloured. My Aquas or Turquoise are light like the ceiling of the old building. I make a cute little yellow booklet to record the number of triangles and units I have. I also have a black binder to print off Bonnie's instructions. Part of the time I quilted on my old singer machine. It sits in the family/ living room next to a window so there is great light to sew by during the day. We have so little sun now that sitting in the sun for an hour a day is a treat. Here is my box with some parts and pieces. I have done my triangles a little different then Bonnie said. I was cutting from yardage for my Triangle units, so I cut 3" squares and drew a line on the diagonal. 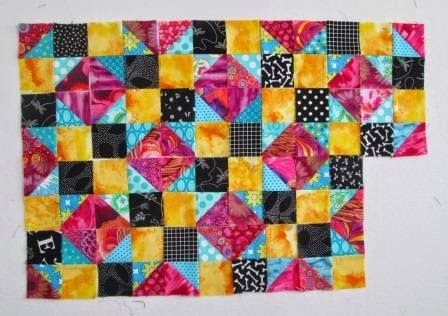 I then sewed 1/4" from that line and cut the two triangles apart. I then have to iron and trim the triangles to 2 1/2" square. I love how the triangles are so perfect. Here is the design wall with the first little batch of units. There are measuring perfect 4 1/2" square. Here is last years mystery quilt. I still need to sew the blocks together. I was hopping to do that last week but it did not happen. The pattern is asleep now but should come out in Bonnie's next book. 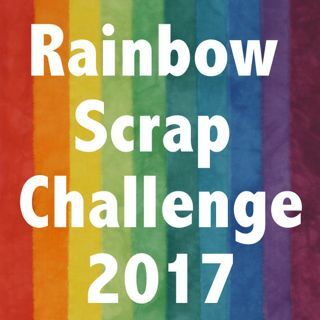 I had made some big changes to the colours last year. his year I am keeping much closer to Bonnie's colours. Love your blocks and the colors. Excited to see what the finish will look like. I think your Celtic Solstice is my favorite of all the ones I've seen! Stunning! Glad you are able to play along this year. 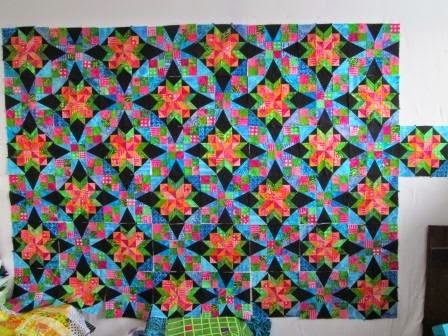 Your quilt from last year is gorgeous! Love the colors in your Celtic Solstace. The center units look like little flowers. Love the way you've lined up the Grand units on your wall in their own design. Mine? They're in stacks of 10 in a recycled styrofoam tray! Beautiful fabrics. Looks like last years quilt is almost ready too. Hope you find some time soon to get it all together. 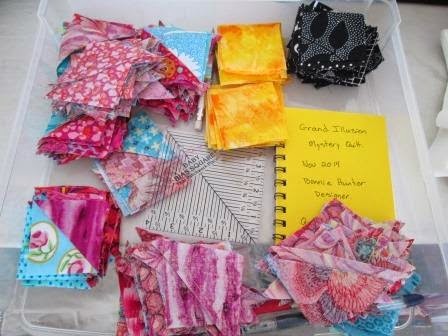 Both of your quilts will be very lovely! Good job! 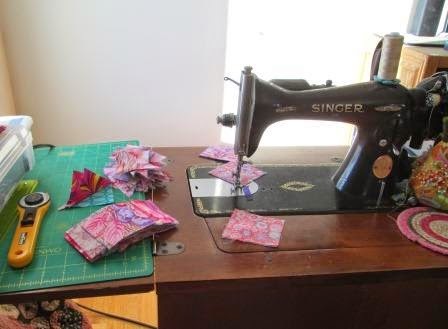 Is that a sew mor machine?